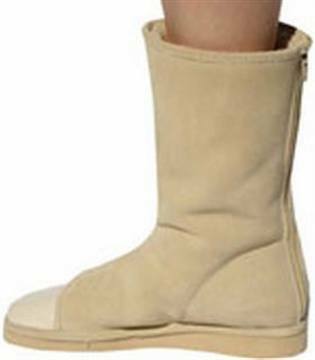 Winter pedicure clients can keep their feet warm and their toenail polish intact when they wear these innovative open-toed boots home from the salon. Getting a pedicure is a snap in summer, but coldwinter weather can present problems for clients whomay not want to walk around town in flip flops while their polish dries. Living in Manhattan, I would wear boots to the nail salon, bring my flip flops, get a pedicure, then have to walk home wearing flip flops and carrying my boots. I wouldn’t be able to do any errands because my feet were freezing,” says Deanna Kipnes, one of the creators of Bootie Pies. These cozy, pedicure-friendly boots are worn to the salon, then slipped back on when your pedicure is nearly complete.The boots’ toe area features a patent leather flap that presses down and tucks under, leaving the toes exposed and ready for polishing. "The boots are made of genuine suede and providegood traction for winter weather,” says Kipnes. The company plans to make Bootie Pies available for salon retail some time in 2007, but the $128 price tag may put off all but the most ardent pedicure fans. For more information, go to Bootie Pies or call (732) 946-3939. For more information, visit Bootie Pies .